Student competitors and onlookers gather for the robotics competition at TAF’s Tech Expo on May 18. The White Center neighborhood on Seattle’s Southside may not be known as a mecca for the tech-savvy like the Eastside or South Lake Union, but on May 18, that all changed. 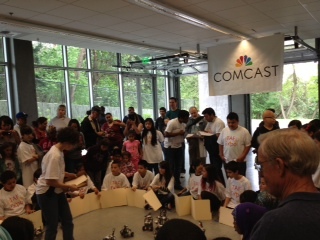 Comcast was the presenting sponsor of The Technology Access Foundation’s (TAF) annual Tech Expo. Five hundred attended the event for the stunning showcase of work by local students of color who call the White Center area home. TAF’s Tech Expo highlights its work with youth through STEM preparedness programs and coursework in robotics, graphic design, video game design, and more. TAF believes exposing kids early on to STEM and following them from K-12 will increase their chances of success and opportunities historically out of reach for students of color. “The Expo is a way for us to create a larger STEM community by showing kids and their parents that there are hundreds of other students in TAF programs that they can connect with now and in the future,” said TAF Executive Director and Co-Founder, Trish Millines Dziko. Tucked away within White Center’s Lakewood Park, TAF’s new modern digs houses the hopes and dreams of 700 local youth. The building itself, called the Bethaday Community Learning Space, serves as an oasis for kids, some of whom are without access to Internet service at home – a major hurdle for students looking to break into the STEM world. Enter Comcast. Comcast believes increasing broadband access among low-income residents – a cause the company has shifted its full weight behind – means partnering with organizations like TAF. The group’s unique and direct approach in bringing a STEM education to students of color is an invaluable component in addressing digital access and awareness of what technology can do to improve people’s lives. Plus, partnering with a technology and media company like Comcast means cool prizes. As the proud presenting sponsor, Comcast handed out Netbook laptops to the Grand Prize winners of the Expo’s robotics competition and backpacks full of school supplies to the second and third place winners. Comcast was proud to support the Expo, along with many other events this spring, and are committed to working with its partners, like TAF, to make every family’s home a mecca for the tech-savvy.